just to say hello and that I'm currently repairing a little Alvari 8-bass. At some point I'll have to work out why that one key is sticking up, but that's for another post! Best of luck with the repair. The key sticking up is most likely because it accidentally caught on something (like the straps). Unless you are really unlucky you should be able to bend it back down by pressing down the mechanism at the pallet (not the pallet itself), the hinge mechanism and the key. 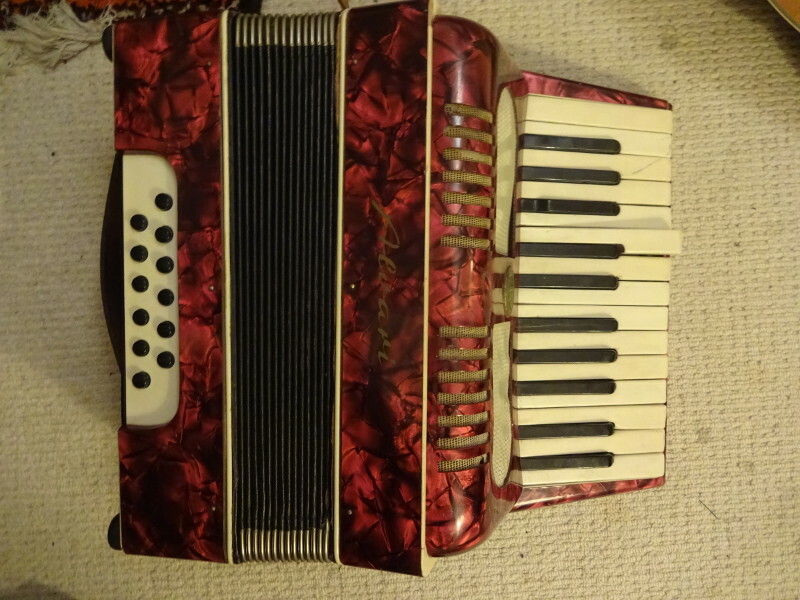 (And if you are unlucky the key will break off...) It would be good to start the repair with that because when it breaks it most likely means the accordion is a write-off considering its value versus repair cost. I'd be really curious to see some in-process pictures as you repair it. I've never been brave enough to do much on my boxes. (08-02-2019, 03:48 PM)craptiger Wrote: I'd be really curious to see some in-process pictures as you repair it. I've never been brave enough to do much on my boxes. One of the first things you learn in a repair course is to take many many pictures, of every small step of the process. That way you are guaranteed to have pictures that show how to put the instrument back together! All the valves? I`m curious as to whether you replaced both sides of the bass reeds without removing and re- waxing. (23-01-2019, 11:57 AM)...It\s all going pretty well so far: I've replaced all the valves with new vinyl ones on the bass side, and now I'm about to attempt the treble side (which has a lot more reeds!) Wrote: At some point I'll have to work out why that one key is sticking up, but that's for another post! I wonder about this too. I may be a bit clumsy but so far I have not managed to replace a valve on the inside without taking off the reed plate. I know there are some highly skilled repair people who can actually do it but you need a delicate and very stable hand. For me popping out the reed plate and rewaxing is far easier and faster. I'm fairly new at this, but started with a 1935 48 bass that hadn't been played for years, so it had lots of tired valves. 3) Optional - in my case stronger glasses. A good hint is to replace the outside valve and then cut the new inside valve to the same size. My hat is of to you! I tried it once and managed to push out a bunch of reed plates due to me not considering the obvious state of the wax condition and taking the necessary precautions to prevent what happened. Matter of fact I`ve loosened an outside reed plate or two on more than one occasion . It`s always a chance with vintage instruments. Since then , my rule has been if a good many of the valves need replacing the wax most likely is overdue too. Yes, definitely hear what you're saying. But I was new to this and considered rewaxing as a step above what I could expect to work with my skill level. Luckily the 40+ year old wax wasn't loose, although replacing it might have been better. I've since rewaxed individual plates (soldering iron method) and that's quite easy really. (20-02-2019, 12:56 AM)Glug Wrote: Yes, definitely hear what you're saying. 40+ year old wax may indeed be brittle, and just melting the wax can be a temporary solution but replacing with new wax is definitely better. I have done this on a 50 year old Crucianelli (Super Video) and on a Pigini Sirius bayan (coming back in for minor retuning today). That Pigini had reed plates falling out, not yet while playing but during transport, when banging it (gently) or while working on it. You cannot do tuning on an instrument with brittle wax even when the reed plates are not yet falling out because the tuning changes when a reed plate does not make good contact with the reed block. I have seen reed plates that were held in place through the side contact of the wax with adjacent reed plates, not through contact with the reed block. That causes air leaks (raises pitch) and instability. Contrary to what people sometime say rewaxing (with new wax) is not an easy job. It takes practice and skill to pour wax in the narrow space between two reed plates without spilling any on the face of the reed plate, the reed itself or the valve.